Thank you again for the generous camp scholarship for our son, Marchall Wilbur, who was able to attend Camp Courage in July. We are so happy that he can participate in Camp Courage and we can relax a bit knowing he is in good hands with people who understand his medical needs. 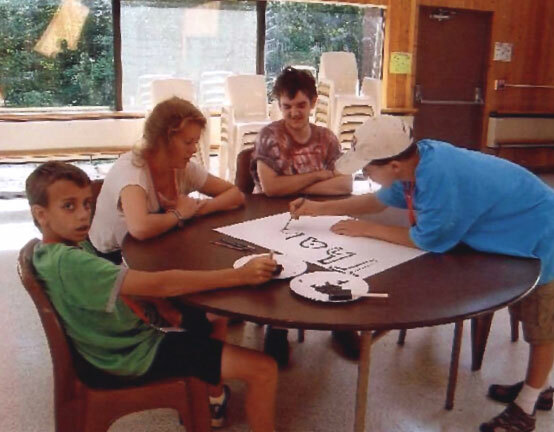 He participated in many activities at camp and the counselors said he enjoyed Arts and Crafts, Music and Drama, swimming, boating, fishing, nature walks and the outdoor living skills. He particularly loved the camp fire evenings. Here are a couple of photographs of Marshall at camp, one of which shows him smiling at the table (He´s wearing a reddish tie-dye shirt). Though he doesn´t tell us much about the experience at camp, images of him smiling are great to see. Thanks again for the generous assistance.